So National Drink Wine Day huh? I thought that was every day… but maybe that’s just me. So I figured to commemorate this holiday of holidays I would share what I’m celebrating with. Powers Winery was established in 1982 by Bill Powers, one of the winemakers responsible for putting Cabernet from Washington State on the map. Bill has since quasi-retired and his son Greg has taken over the reigns, and is making pops proud! They are based in Columbia Valley with a fair amount vineyard that is utilized towards both their Powers wines and their organic label, Badger Mountain. They make a handful of single vineyard wines from outside of Columbia Valley, including Coyote from Wahluke Slope, Sheridan from Yakima Valley, and then my favorite, Champoux from Horse Heaven Hills. Unlike most producers that make single vineyard wines from vineyards outside of their own, Greg Powers oversees the process from budding, to pruning, to harvest and beyond. This is not simply sourced juice that they’re throwing in barrel with their fingers crossed. For those of you not familiar with Horse Heaven Hills… It is a moderately low elevation mountain range running west to east, essentially connecting Yakima Valley and Columbia Valley. This is where grape growing began in Washington State roughly 120 years ago (give or take, I’m going off of memory here people). So needless to say 3H is a pretty special place to begin with, and Champoux Vineyard is the Cru vineyard of the appellation (and quite possibly the entire state!). So as I said, this is my favorite wine from Powers. I’ve gone on record in the past as saying that if this wine had those four magic Cabernet letters for consumers on the label, N-A-P-A, this bottle would be AT LEAST $75 on the shelf… but instead it’s a bargain at $35 (USD)! Admittedly the wine is still a bit young, it could definitely use a few more years of bottle aging, but even in it’s infancy it’s super expressive and complex. On the nose I’m getting notes of black cherry, ripe blackberries and molasses, with subtle notes of black licorice, pine sap and fresh churned loam. It has an expansive palate with notes of dark fruit, bitter chocolate, sweet pipe tobacco and pantry spices. There’s a lovely acidic undertone to the wine that helps cut through the decadence, and your typical dusty Washington tannins give the wine a firm backbone. The finish is relatively short, but not unsatisfying. Like I said, it’s still young and needs a few years to truly come into it’s own, but even now it’s better than 90% of the Cabs you find on the shelves. If you open it now, I strongly recommend decanting for at least an hour, it’s worth the wait. Food Pairings… You have to go big here. Steak, chops with a nice char on them or even BBQ are what you need to stand up to this bad boy. You know what!? Everybody else scores wines, I’ll get on the bandwagon! The score from perfectpairingsathome.com… 92+ points. The “+” simply means I’m giving it a 92 as-is, but that I feel it will improve with time and deserve a higher score in the future. If you find some at your local store, grab it. If not it can always be purchased directly from the winery. Cheers! 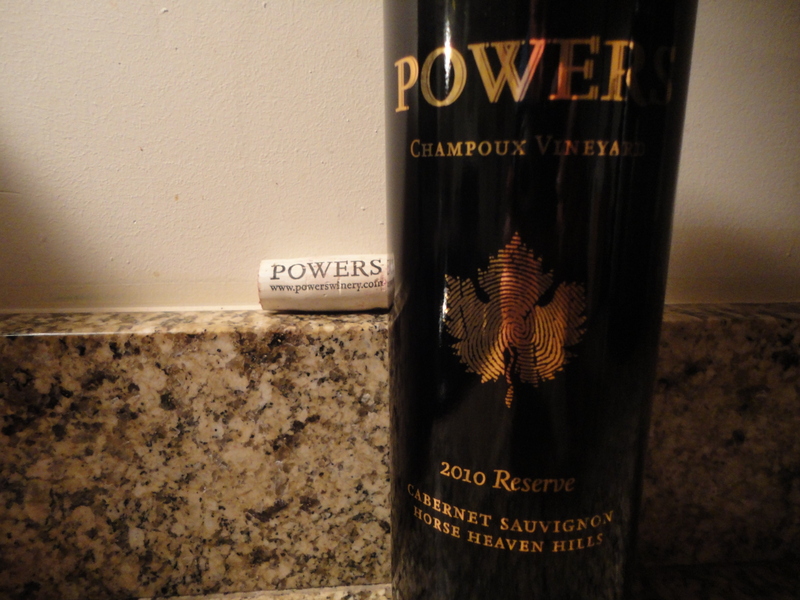 Tags: cabernet, champoux, powers, powers winery, washington state. Bookmark the permalink.